Carrot Cake Cheesecake is a delicious dessert that is mixing two of the best cakes together in one. It is the perfect cake to go with on your Easter table. We have plenty of delicious and amazing cakes on our blog. 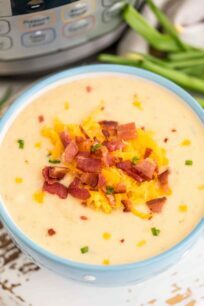 This one can be served on the Easter table along with classic egg salad, scalloped potatoes, and deviled eggs. 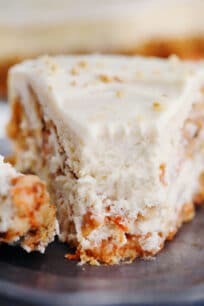 Carrot Cake Cheesecake was always a favorite of mine. 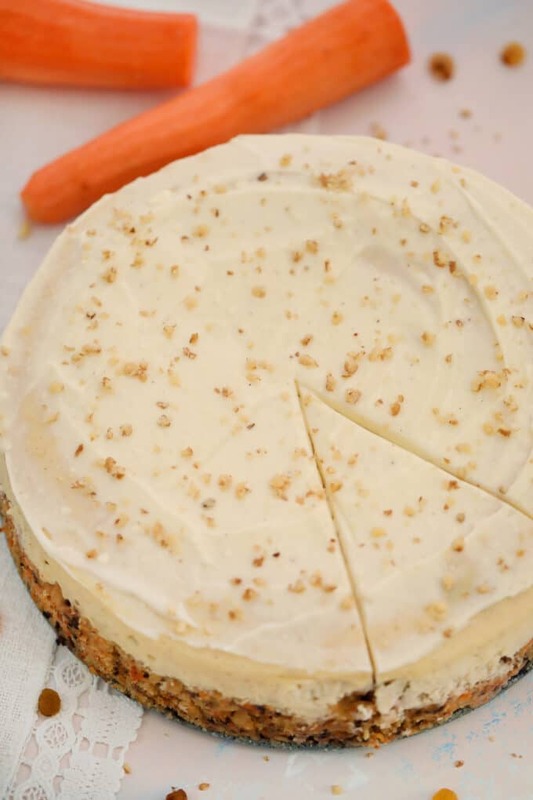 After making so many cheesecakes on our blog, we got a lot of requests to combine them with the carrot cake. 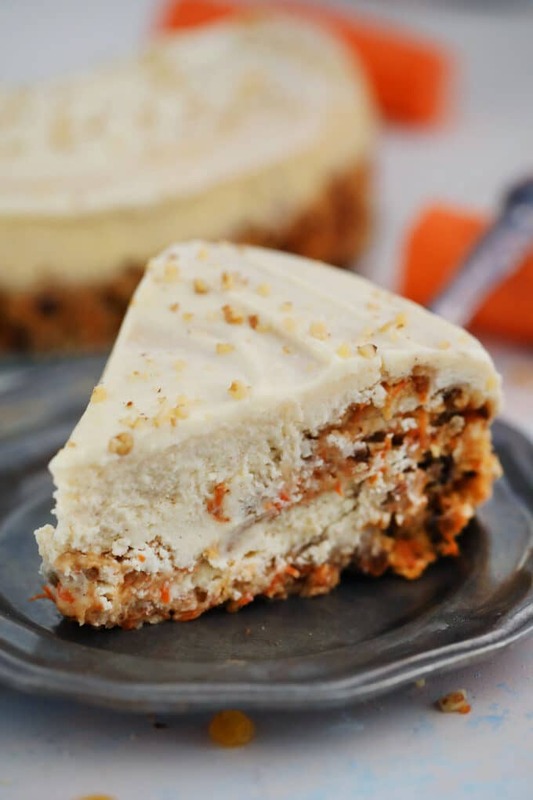 As a result, we present you one of the best and most delicious Carrot Cake Cheesecake. It has all the notes of a fancy and rich cake. 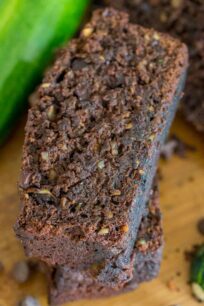 It is dense, rich with a festive look to it, and very flavorful. The hardest part of making this recipe is waiting. Because it is made of cream cheese, you will have to refrigerate it when assembled. However, don’t get scared. 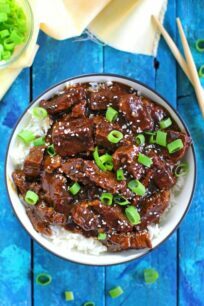 It is totally worth the wait, the rest is pretty simple if you follow the recipe. 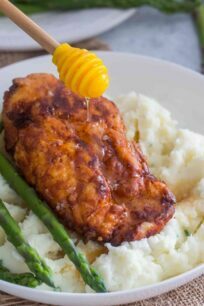 You can top it with your favorite ingredients, such as pecans. Each layer is filled with deliciousness, and once you bit into it, you are guaranteed to love it. 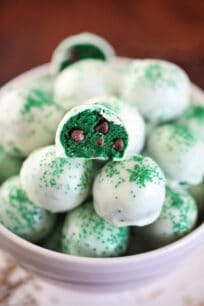 Whether you want to serve it for Easter, birthday party, or special occasion, it is the perfect dessert to go with. First, make sure that all the ingredients are at room temperature and well combined after mixed. Also, adding flour to the batter helps prevent cracks. Don’t overbake the cake, watch for the sides to be puffed and the center of the cake to be slightly wobbly. Coo the cake in the oven, with the door, slightly cracked. Bake it in a water bath. First, let the cheesecake completely cool and refrigerate for at least 6 hours. Next, dip a spoon or spatula into warm/hot water and gently push and press down in the area of the crack to try to close it. Use the back of the spoon to smooth it out. Clean the spatula or spoon often, as the batter will stick to it. Lastly, add a thin layer of sour cream topping or cream cheese frosting. First, wrap the outside of the springform pan in a double layer of foil. Cover the bottom and sides of the pan well. Set the pan in a large roasting pan that is deep enough to add water to it. Then, pour HOT water into the roasting pan, about halfway up the sides of the pan. Next, transfer to the pre-heated oven and bake per recipe directions. Lastly, cool the cake in the oven with the door slightly cracked for one hour. After which transfer to a wire rack to cool completely. To save time you can use a Carrot Cake mix. Measure precisely the dry ingredient, and do not pack the flour into the measuring cup. Otherwise, you’ll end up with a tougher cake layer. Also, add spices such as ground cinnamon, ginger, and nutmeg. 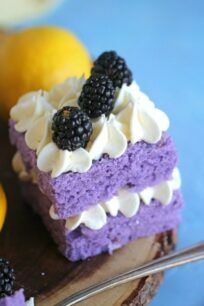 They add such an amazing flavor to this cake. You can decorate it the way you like by adding nuts or other ingredients. For the cheesecake layer is very important for the ingredients to be of room temperature. Also, do not overmix the batter. Use a water bath for best results. If your cheesecake has some minor cracks, don’t panic, they are very easy to fix, just check the tips above. Cover the bottom and outside of a 10-inch springform pan from the outside. Lightly spray the inside with baking spray and set aside. In a large bowl, beat cream cheese for 1 minute. Add sugar, salt, cinnamon, nutmeg, and flour, mix until completely combined and there are no lumps. Scrape down the sides of the bowl with a spatula. With the mixer on low, add the eggs, one at a time, and beat until just mixed through, do not to over-beat. Scrape down the sides of the bowl with a spatula. 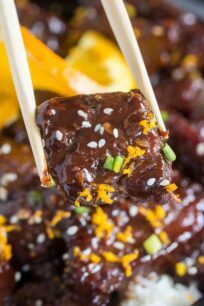 Add vanilla extract and sour cream, beat until mixed through, stopping to scrape the sides and bottom of the bowl with a spatula. Using a measuring cup, add the cheesecake batter to the prepared pan, on top of the carrot cake batter. Smooth the top. Transfer the cheesecake to the preheated oven and bake it for about 50 minutes. Or until the cheesecake is just slightly wobbly in the center, but puffy and settled on the sides. Turn off the oven and crack open the door. Cool cheesecake completely in the open oven. Once completely cooled remove from the oven and refrigerate for at least 5-6 hours. Run a butter knife around the edges to release it from the pan. Store in the fridge until ready to serve. Whisk cream cheese, sour cream, sugar, and milk until fully combined. Spread it on top of the cheesecake and garnish with chopped walnuts. Chill for 30 minutes. I love carrot cake and adore cheesecake! Can’t believe I’ve never combined the two! Excited to give this a try! Hi Jacque, yes this one is a favorite of ours. We really love it a lot, its the best of both worlds) Let us know how you liked it. 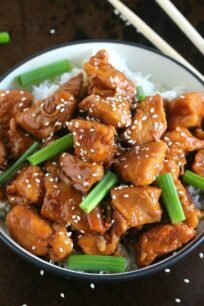 I Love this recipe my getting mouth watering while seeing this pictures. 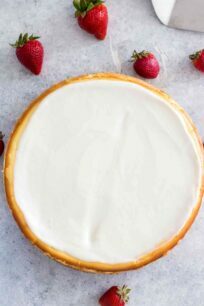 I’ve always been too intimidated to try my hand at making cheesecakes but love how you broke down the whole process step by step. Going to give this a shot this weekend. Wish me luck! This is a great Spring dessert! I cannot wait to make it for my family!